I have seen Gentleman’s Agreement a number of times and still enjoy it. The Moss Hart screenplay of gentile reporter, Philip Schuyler Green(played by Gregory Peck), going undercover as a Jew to give an angle to his story about anti-Semitism provides an excellent vehicle to explore the myriad of ways prejudice can manifest itself. Although anti-Semitism is the specific prejudice addressed, the hate and bigotry expressed is relevant to any person or group be it religion, race, sexual orientation, or anyone considered “different”. I found the script to be intelligently written and though some viewers may consider the movie’s pacing slow, I liked the theatrical dialogue. This is our second best picture winner dealing with anti-Semitism; the other being The Life of Emile Zola. However, the films are in no way similar and offer perspectives from different eras and viewpoints. There were many memorable scenes in the movie but I found two particularly intriguing. One involved Philip Green’s son Tommy (played by a very young Dean Stockwell) who asked what a Jew was and why some people didn’t like them. It was clear from the boy’s inquisitiveness, innocence and absolute belief that his father’s explanation would lay the framework for Tommy’s own system of values and beliefs. If his father had responded to his question with an anti-Semitic or racist answer, the child certainly could have grown up with those ingrained prejudices and passed them on to his children. The other scene was toward the end of the film when one of the characters proclaims that maybe this will be the century when prejudice comes to an end. A wonderful thought be alas it proved not to be. I was surprised that a movie written in 1947 would have very limited mention of World War II and absolutely no reference to the Holocaust. The film’s black and white cinematography is beautiful and I’m not sure New York City ever looked so clean. We’ve had a short break since our last commentary and I had forgotten the pleasure I get from observing the era’s clothing, cars, furnishings and architecture. I had also forgotten the endless chain-smoking – it’s no wonder tobacco use continued its pervasiveness for generations given society’s emulation of motion picture stars. I also have to admit that one historical character that was referenced more than one time in the movie, Gerald L.K. Smith, was unknown to me. After doing some basic research, I learned that Mr. Smith was a well-known anti-Semite in the 1940’s who, along with his publications and speeches, urged the release of Nazi war criminals convicted at the Nuremberg Trials. The cast was very strong. Gregory Peck was nominated for best actor; Dorothy McGuire was nominated for best actress (as Kathy Lacy – Phil Green’s love interest); and Celeste Holm won best supporting actress (as Anne Dettrey – fashion editor at the magazine). McGuire’s performance felt a little stilted to me but I loved Celeste Holm. I still can’t understand how Phil Green could have chosen Kathy Lacy over the obvious better choice to me of Anne Dettrey. Phil Green’s mother, played by Anne Revere, was also nominated for Best Supporting Actress. Although not nominated, John Garfield’s portrayal of Dave Goldman, Phil Green’s Jewish childhood friend, was very convincing. This film won Director Elia Kazan his first Oscar win as well, but we will cover his second best picture, On the Waterfront when we get to our reviews for the 1950’s. Although by this point, Kazan’s reputation would be tarnished through his cooperation with the House Un-American Activities Committee (HUAC) and their compilation of the Hollywood Blacklist. 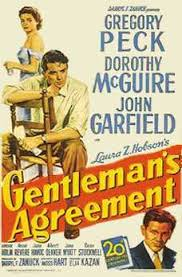 Although the themes of prejudice and intolerance have been portrayed in numerous films since Gentleman’s Agreement was first screened, I do not find the film dated. Hopefully this will be the century when prejudice comes to an end. Gentleman’s Agreement is a film directed by Elia Kazan that tackles a subject which was widespread in America in the 1940’s, anti-Semitism. While I’ll address the film shortly, I want to preface my comments on the film with a statement about Elia Kazan. Kazan was a gifted filmmaker who won two Academy Awards for Best Director for his work in both Gentleman’s Agreement and another best picture winner, On the Waterfront. However, I cannot condone the role in which Kazan played in naming names in front of HUAC during his interrogation. During the great depression he had been a member of the American Communist Party in New York, and therefore Kazan overcompensated and provided testimony in order to save his own career despite the effects it had on the people whose names were mentioned. The great irony of his participation in Senator Joseph McCarthy’s witch hunt was the largely anti-Semitic undertones of the trial. Outing Jews as communists was a common way of discrediting Jews in American society without being openly anti-Semitic. So while in my opinion, this injustice will always tarnish my view of Elia Kazan as a person, his directorial work still exhibited signs of genius. While the subject of this film tackles a serious issue that was a significant problem in society at the time, antisemitism, I feel the way the film introduces the plot device is a bit convoluted. Gregory Peck plays hard-nosed reporter, Philip Schuyler Green, who has made a name for himself in the journalistic field by going deep within the communities that he depicts in his pieces. I n the film, Green is given a new subject as his his publisher John Minify (Albert Dekker) tasks him with capturing the controversial theme of antisemitism. Philip Green decides that the best way to learn about antisemitism firsthand was to pretend he was a Jew in society and study the results. While pretending to be a Jew seems easier than Hunter S. Thompson’s adventures with the Hell’s Angels, at that point in time in there was still a large cultural stigma against Jewish people. This movie tackles the subject from a variety of different angles, i.e. the repercussions of dating a Jew for a non-Jew (gentile) among WASPy Connecticut socialites. The inability for Jews to rent in different apartment buildings or to stay at certain hotels was illustrated in particularly vivid detail with Gregory Peck playing the role of the rejected Jew brilliantly. His role as the moral compass of the film reminded me of his later role as Atticus Finch in the film adaptation of Harper Lee’s To Kill a Mockingbird. While I was watching the film, there were certainly parts where the depiction of the issue felt a bit dated to me. The doctor who visited Philip Green’s mother after a late night attack was smoking a cigarette as he delivered the prognosis. I also found the acting of Kathy Lacey (Dorothy McGuire), the publisher’s niece and Phillip Green’s love interest to be a bit overstated and melodramatic which can occasionally be indicative of movies of this time period. Luckily, the bigotry towards Jews displayed in the film has also become a more dated concept. Although, I would be remiss if I did not mention that some anti-Semitism still exists in our country today, it just has been forced to a more underground role now that it is not socially acceptable. Anti-Semitic sentiments now disgrace prominent figures in the media (*cough* Mel Gibson *cough*) rather than being the norm. Even in our assessment of the prominent figures from the early 1900’s, history seems to sweep under the rug the hatred displayed by some of the country’s most powerful people. If you are curious about the subject, do a little digging into the views that Henry Ford, Charles Lindbergh, and Walt Disney had on Jews. I will give Gentleman’s Agreement a lot of credit for their courage to tackle this difficult and unpopular topic. Two years after the WWII and the horrors of the Holocaust, Hollywood decided to comment on the hatred here in our society that allowed for the atrocities to happen in another country. While I am biased against Elia Kazan, I will give him credit for directing a powerful morality piece that forces viewers to evaluate their own personal beliefs and possibly the roots of their own irrational hatred. It definitely took an actor like Gregory Peck to deliver a performance that raised the sentimentality in the film from hokey to inspirational. I found the storyline with Kathy Lacey to be a bit contrived, and while her sentiments towards society’s view of dating a Jew were probably accurate, Gregory Peck was too quick to forgive her truly hateful views. The film just felt like a first step in dealing with bigotry, rather than hammering the point home. It just didn’t quite deliver the gut-wrenching message that an anti-bigotry movie should be able to. My final rating does take the historical context into account because it was truly important at the time of its release, however its effectiveness and ability to deliver its message have waned during the passage of time.